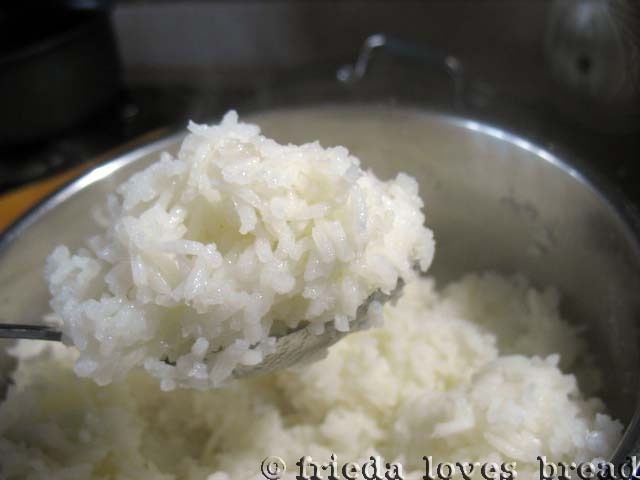 Here is a secret to making a fluffy, white rice that doesn't clump! Rinsing your rice takes a lot of the starch out that causes clumping. Any long grain rice will work well for this recipe. Another secret is using chicken broth. I used 1 t. McCormick's chicken base to flavor this rice. For 2 cups of rice, use 3 cups of water and one cup of chicken broth. Bring your rice and water to a boil. Reduce the temp to lo and cover. Do not even attempt to lift the lid and peek! After 20 minutes, you can uncover the rice, stir, and see how pretty it looks! Spread the rice in a single layer on a baking sheet and let it cool uncovered in the fridge for a couple of hours. This releases additional moisture for a perfect fried rice. Cover the rice if you are going to store it overnight. 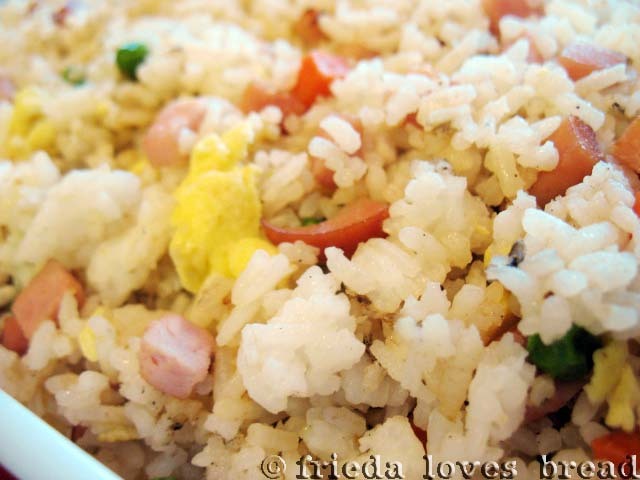 Cold rice is another secret for perfect fried rice! Get you wok ready with a little bit of oil and scramble your eggs. Remove and set aside. Add chopped ham and veggies and fry for a minute or two till cooked. Remove veggies and set aside. 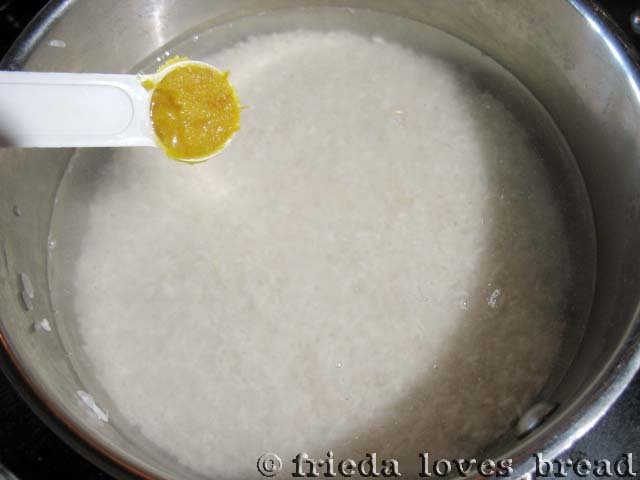 Add remaining oil over high heat and add cold rice, stirring to coat every grain. Return the eggs, meat and veggies to the wok, stirring to heat everything through. Toss in minced green onions and garlic. Add two teaspoons of soy sauce are added at the end ~ use this to enhance the flavor of the dish. Taste to see if it needs additional salt...remember that the rice was cooked in chicken broth and that the ham has salt. This was a great meal in itself for me. This is great re-heated. I enjoyed eating it over the next few days! A great basic ham fried recipe that doesn't turn into a gummy mess. Chilling your cooked rice is one key to preventing clumps of rice. 1. Rinse rice three times, using a fine sieve, until water runs clear.2. 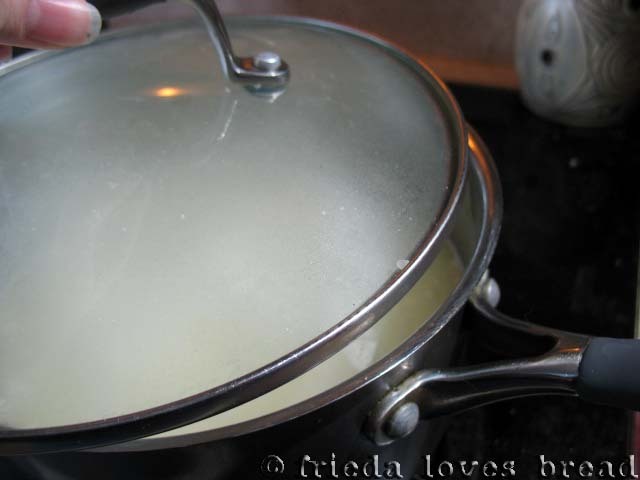 Combine rice, water, and chicken broth in medium saucepan.3. Cover, bring to a boil over high heat, then reduce stove temp to low.4. Cook for 20-25 minutes.5. 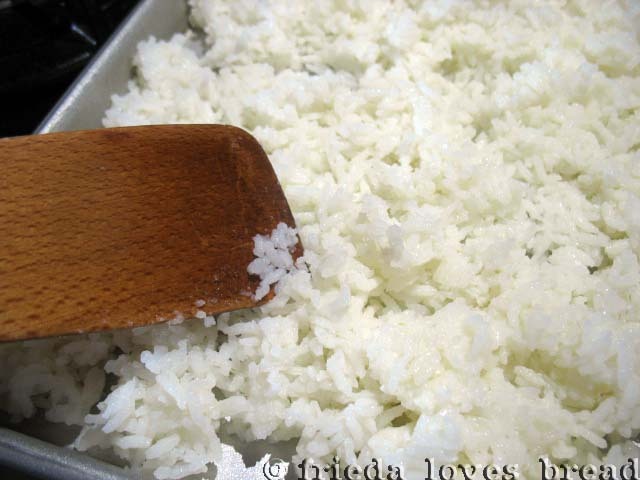 Spread cooked rice in a single layer on baking sheet, uncovered, and set in the fridge for 2 hours. Cover if cooling rice overnight.6. Heat a wok or large skillet over high heat with 1 Tablespoon of cooking oil.7. Add eggs and scramble till cooked. Remove from skillet and set aside.8. 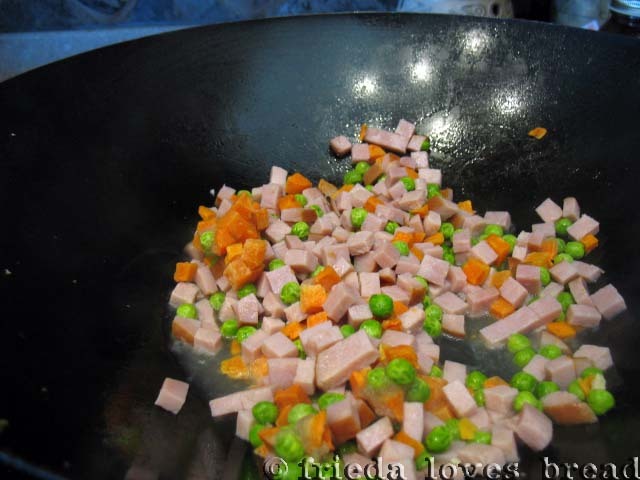 Add ham & peas/carrot mixture and fry for about 1 minute. Remove, set aside.9. Add remaining tablespoon of oil to skillet; heat till hot. Add your cold rice to the skillet and stir to coat every grain. 10. Add your cooked eggs, veggies, onion & garlic, stir well. 11. Add soy sauce, stir and taste. If salt is needed, add up to 1/4 teaspoon of salt to taste. 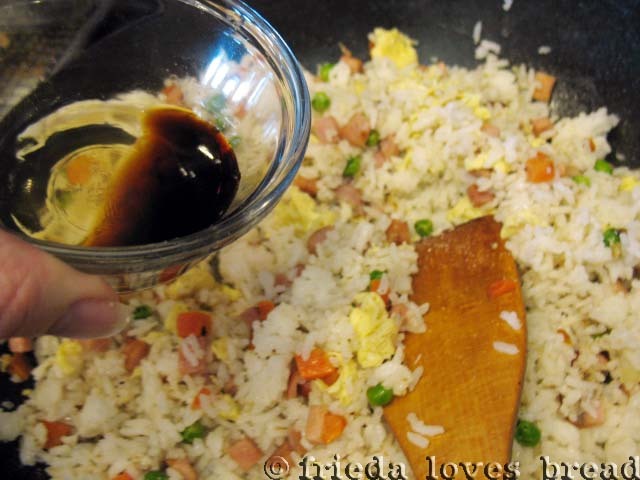 This sounds exactly like me, "I love ham fried rice. The first time I ever made it, it was a gummy bland mess. " I definitely need to give it another try now, you've made me crave it!